Here are a few Hibernate Interview Questions for you! 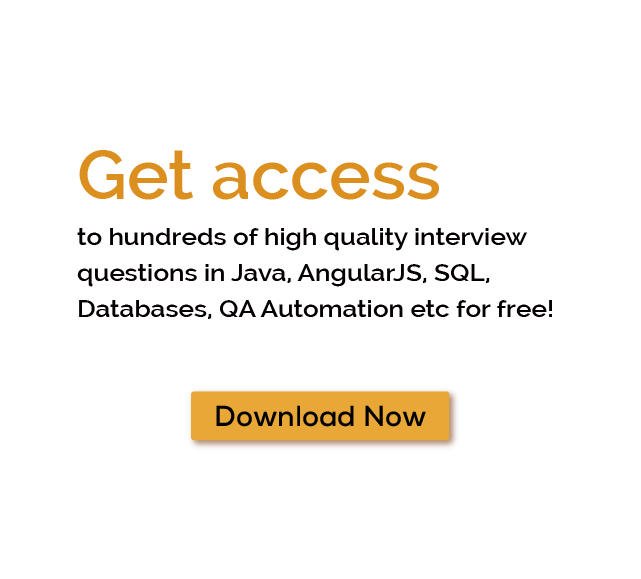 Download more High Quality Hibernate Interview Questions! Hibernate is one of the most popular open source object relational mapping (ORM) tool for Java platform. It provides fast, ultra-high performance object persistence and query service. As the name implies hibernate meaning is mapping a relational mapping between your object and the database table values. Database does not support objects directly and that's why frameworks like hibernate will come in to existence to bridge this gap. The no of such properties available in an object that will be mapped to the field in database table. This hibernate tutorial will provide complete information about all its features. Hibernate allow you to create persistent classes following Java idiom – including association, inheritance, polymorphism, composition and the Java collections framework. Many online hibernate example are available on hibernate javatpoint, hibernate tutorial point websites. Hibernate not only responsible for the mapping of Java classes to database tables, but also provide data query support and retrieval facilities which reduces development time. JDBC means Java Database Connectivity. It provides a set of Java API to access the relational database from Java program. These Java APIs allow Java programs to execute SQL queries. What is Java Persistence API (JPA)? What are the important benefits of using Hibernate Framework? Name some important interfaces of Hibernate framework? Name some important annotations used for Hibernate mapping? What is Hibernate SessionFactory and how to configure it? Hibernate SessionFactory is thread safe? What is Hibernate Session and how to get it? How to implement Joins in Hibernate? Hibernate Session is thread safe? What is hibernate latest version ? What is hibernate caching? Explain Hibernate first level cache? How to configure Hibernate Second Level Cache using EHCache? What are different states of an entity bean? What is usage of Hibernate Session merge() call? What is difference between Hibernate save(), saveOrUpdate() and persist() methods? What will happen if we don’t have no-args constructor in Entity bean? What is difference between sorted collection and ordered collection, which one is better? Why we should not make Entity Class final? What is HQL and what are it’s benefits? Can we execute native sql query in hibernate? What is the benefit of native sql query support in hibernate? What is the benefit of Hibernate Criteria API? How to log hibernate generated sql queries in log files? What is Hibernate Proxy and how it helps in lazy loading? How to integrate Hibernate and Spring frameworks? How to implement relationships in hibernate? How transaction management works in Hibernate? What is cascading and what are different types of cascading? How to integrate log4j logging in hibernate app? How to use application server JNDI DataSource with Hibernate framework? How to integrate Hibernate with Servlet or Struts2 web applications? Which design patterns are used in Hibernate framework? What are best practices to follow with Hibernate framework? What is Hibernate Validator Framework? What is the benefit of Hibernate Tools Eclipse plugin? Why is Hibernate better than JDBC ? Hibernate resolve object-relational issues which occurs when a relational database is connected by an application written in object oriented programming language. In JDBC you need to write code to connect the object model data representation to a relational model but on the other hand, Hibernate itself maps the Java classes to the database tables using XML configuration. Hibernate support to polymorphic queries. Hibernate’s code is database independent as developer need to not change the HQL queries whenever he change the databases like MySQL, oracle, etc and therefore it is easy to migrate to new database. We can also achieve lazy loading of data using Hibernate. Hibernate make association between the tables than JDBC. Summary: Hibernate is an open source commonly used object relational mapping (ORM) tool for Java platform. It is known for its fast, ultra-high performance and query service. Some of the many Hibernate Interview Questions listed below will help you get an idea about what questions gets asked in such jobs related to Software Engineering & Tech. Get through the Hibernate Interview bar with our selected Hibernate Interview Questions for all Hibernate enthusiasts! For thousands of similar Hibernate Interview Questions login to our Website or download EduThrill. Experience the thrill of challenging people around the world on Hibernate Interview Questions!